Sea of Thieves is, in my opinion, one of the greatest, most original video games released in recent years. It is hotly anticipated and with good reason. This pirate adventure allows you to take on open waters with a crew of friends, in search of bountiful booty. Seriously, if you have not played it yet, go out and buy it. You will enjoy one of the funniest and most entertaining games on the market. 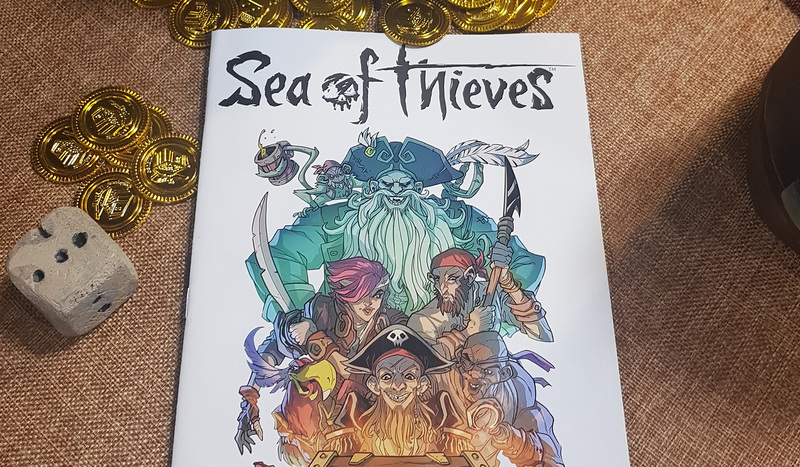 Those of us who have played it will be delighted to hear that Titan Comics is producing a Sea of Thieves comic series. With a release of March 14th, Sea of Thieves is set to make a splash among gamers and comic lovers alike. While the game features an open world in which you are meant to explore and make a name for yourself, the comic will tell the story of a pirate rivalry brewing between twins. Siblings DeMarco and Lesedi Singh will lead two crews out to the “Sea of Thieves” in search of an ancient treasure. Like players in the video game, the crews will encounter the undead, traps, and untold bitterness amongst rival crews. Writer Jeremy Whitley and Artist Rhoald Marcellius are set to take on this adventure comic. Whitley is known for his work on Princeless and Thor vs. Hulk. Marcellius is better known for his art in The Incredible Hulks and Warren Ellis’ Supergod. The pair will likely expand on the already growing lore within the Sea of Thieves universe. Readers will be able to enjoy an original story that takes place on the “Sea of Thieves.” Fans of the game may recognize some of the locations portrayed in the comic as being a part of the game. There are dozens of islands in the game whose backstory will be expanded upon within the comic series. As of right now, the video game does not have an overarching storyline, with the intent being for players to create their own legends and stories within the Sea of Thieves community. The comic series is a great way for players to experience a storyline that takes place in this wacky world. It is also a great way for those who have not played the game yet to experience the quirky and hilarious world created in Sea of Thieves. Many comic book adaptations of video games turn out to be a bust. Do you remember the Assassin's Creed comic? Yeah, me either. I do not think this will be the case for Sea of Thieves. Most video games, like Assassin’s Creed, already have a storyline established and comic series try to tap into that. It usually ends in disaster. However, since Sea of Thieves, the video game, does not have a storyline, I think the comic adaptation has no limits on the range of creativity it can use to develop a fun and interesting story. The series has a unique chance to create and expand on the lore that is in the main game, rather than the other way around. I look forward to reading this comic series, which promises to be unique and entertaining.